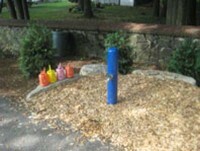 The SPARK (Supporting Parents and Resilient Kids) Center is a program of Boston Medical Center. Unique to New England, this program provides therapeutic, medically-specialized programs for infants, toddlers, preschoolers, school-aged children, teens and young adults. They currently serve more than 100 children and youth annually. 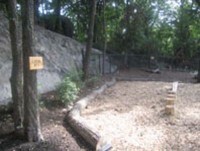 “Teaching children about the natural world should be seen as one of the most important events in their lives.” This Thomas Berry quote from The Dream of the Earth was chosen to be included in the program for the ribbon cutting ceremony and echoes the sentiments of staff and families associated with the natural play yard. Children are ushered outside each day to run, jump, swing, climb, and use all the large muscles in their bodies. Physical exercise and fresh air are important for all children’s health and well-being. This location was fortunate to work with unspoiled natural resources including fully grown trees, plants and a natural rock face. Trek decking was used to build the fort and dramatic stage area. 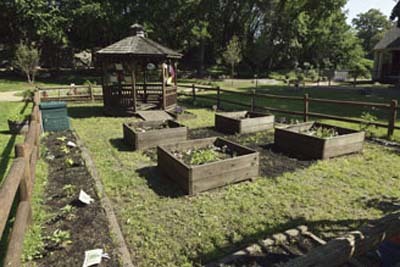 The therapeutic garden with gazebo serves as a focal point for the classroom both visually and socially. 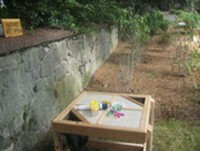 Observations of children’s play, and frustrations, in the traditional playground, were used to make design choices in the redesigned space. There are many opportunities for family involvement at SPARK on an on-going basis. Some of the past events have included an Easter egg hunt, carnival, open house and dedication. SPARK shows how a well-designed space serves children with different challenges, but also how time spent in a well-structured outdoor classroom can reap many benefits for all children. Exploration of nature has cognitive, physical, social and emotional benefits for children particularly those with special emotional and social needs.